Witness interviews, talks, live performances by WOMEX artists and more recorded and broadcasted around the globe. Expanding on the tradition of the WOMEX Radio Studio, WOMEX 18 will continue the enhanced Radio Studio set-up, including a series of live EBU Radio Sessions. The WOMEX Radio Studio is an intimate setting to get up close and personal with artists and media professionals. For all broadcasters attending WOMEX, this is a must-go; get your music and your story on the airwaves inside and outside of Europe. As slots are limited, please book early - come to the media counter to see what's available. This year's studio is a cooperation of EURORADIO of the EBU (European Broadcasting Union) with RBB (Germany), WDR (Germany), and NRK (Norway). 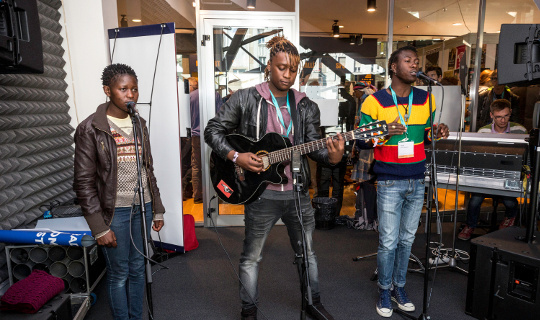 As part of the WOMEX Radio Studio, the EBU and its partners offer live music sessions with artists of the WOMEX Official Selection and other WOMEX artists performing in intimate settings in front of an audience of world music lovers. The sessions are recorded and/or broadcast live and offer an additional platform to learn more about the WOMEX artists and get insights to their stories.